NFL playoffs 2014: An insane idea to ensure that the best teams have the best chance to win. An insane idea to ensure that the best teams have the best chance to win. 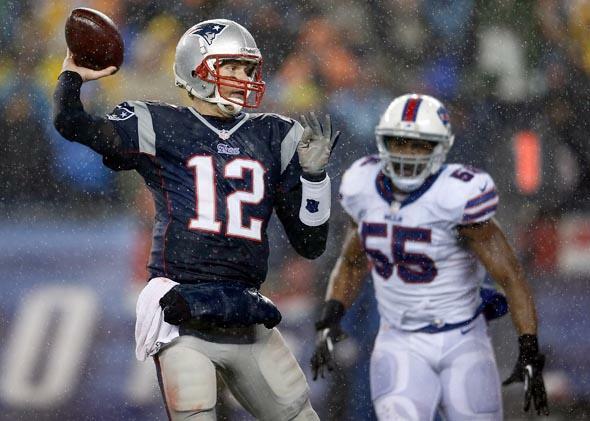 The New England Patriots’ Tom Brady throws for a two-point conversion versus the Buffalo Bills in the last game of the 2013 NFL regular season. A less random playoff system would make late-season games like this even more meaningful. A version of this story originally appeared on Football Perspective. One of my favorite sabermetric baseball articles of all time was written by Sky Andrecheck in 2010—part as a meditation on the purpose/meaning of playoffs and part as a solution to some of the thorny logical concerns that arise from said mediation. The basic conundrum for Andrecheck revolved around the very existence of a postseason tournament because—logically speaking—such a thing should really only be invoked to resolve confusion over which team was the best during the regular season. To use a baseball example, if the Yankees win 114 games and no other American League team wins more than 92, we can say with near 100 percent certainty that the Yankees were the AL’s best team. There were 162 games’ worth of evidence. Why make them then play the Rangers and Indians on top of that to confirm them as the AL’s representative in the World Series? Andrecheck’s solution to this issue was to set each team’s pre-series odds equal to the difference in implied true talent between the teams from their regular-season records. If the Yankees have, say, a 98.6 percent probability of being better than the Indians from their respective regular-season records, then the AL championship series should be structured such that New York has a 98.6 percent probability of winning the series, or at least close to it. If you spot the Yankees a 3–0 series lead and every home game from that point onward, then they have a 98.2 percent probability of winning, which is close enough. This style of setup may seem strange (and, admittedly, the 1998 Yankees are an extreme example), but it preserves the integrity of the regular season by tying the odds of postseason success quite directly to performance during the six months leading up to the playoffs. And despite the long odds, there’s still an opportunity for the underdog to turn the tables and advance. It would take an incredibly improbable sequence of events, but that’s what a team should have to accomplish in order to undo 162 games’ worth of evidence in the opposite direction. As for football, the NFL obviously doesn’t play postseason series, but the same concept can still be applied. Instead of spotting games in a series, we can spot a team points before the kickoff. In the NFL, Chase Stuart and I once found that a team’s “true” talent can be estimated by adding 11 games of .500 ball to its regular-season record. Using that, we can calculate the probability of either team’s true talent level being higher in a given matchup, and add points until the pregame win expectancy matches said probability. What would the divisional round look like in a world where the best teams start out with an advantage on the scoreboard? In the AFC, the Broncos would get a massive 12–0 lead over the Chargers while the Patriots would have a miniscule 1­0 lead on the Colts. In the NFC, the 49ers would be up 3–0 on the Panthers, and the Seahawks would get off to a 5–0 start against the Saints—enough to reward the NFC West teams for their superior regular-season performances, but not such big leads that the NFC South franchises would be cooked before the first quarter begins. One benefit of this setup is that every regular-season game matters. No longer would teams have nothing to play for and rest their starters in Week 17, when an extra win could very easily make the difference between winning and losing a playoff game. Of course, maybe such unpredictability isn’t a bad thing—the NFL’s popularity has never been greater than during this period of wacky playoff outcomes—but if the goal is purely to make the playoffs fairer and give regular-season games more meaning, a handicapping system like this would reduce the role of randomness and ensure that the best team is rewarded more often with postseason success.